I got a mess of jasper beads given to me by a friend. In this bag, were drilled focal beads in all different shapes and sizes. They are all perfect sizes for pendants. I love this little orbicular jasper, also ocean jasper. 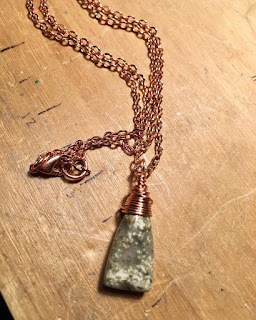 It was the perfect stone to wrap in copper, not only because of its color, but because of its properties. Copper is an energy conductor and helps to amplify your thoughts. It also boosts your self-esteem. When someone is feeling agitated, angry, or distraught, your calming energies will help them calm down as well. Orbicular jasper is known to be a nurturing and protective stone, like all jaspers. It can help encourage patience, release emotional blockages and rid us of pent-up anger. It is a stone of joy and renewed enthusiasm for the cycles of life, especially when worn or placed over the Heart chakra. Orbicular Jasper eases depression and encourages empathy towards others, while at the same time preventing rivalries. 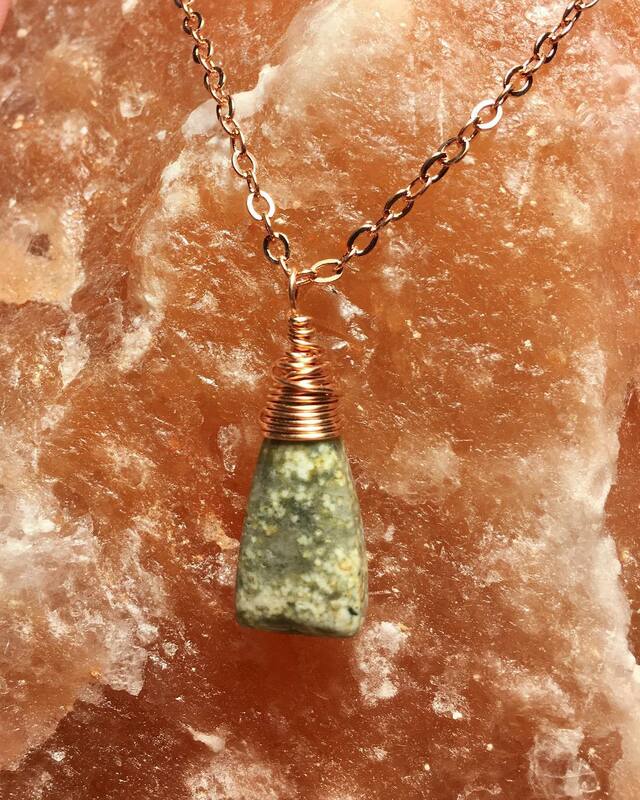 When placed over the Solar Plexus chakra, this Jasper will help to remove chronic stress. See how these are great companions!! !